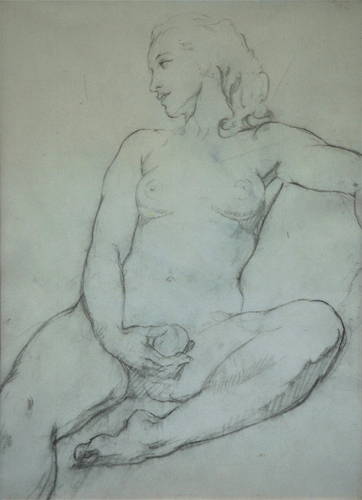 c1920, 5 x 9.4cm Rose was the model. image size is 15.1 x 11.5 cm. 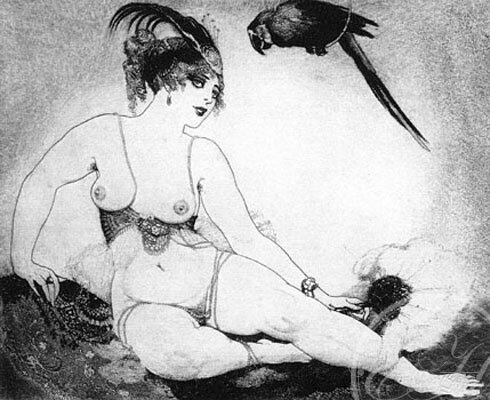 Etching House buy original paintings and art by Norman Lindsay. 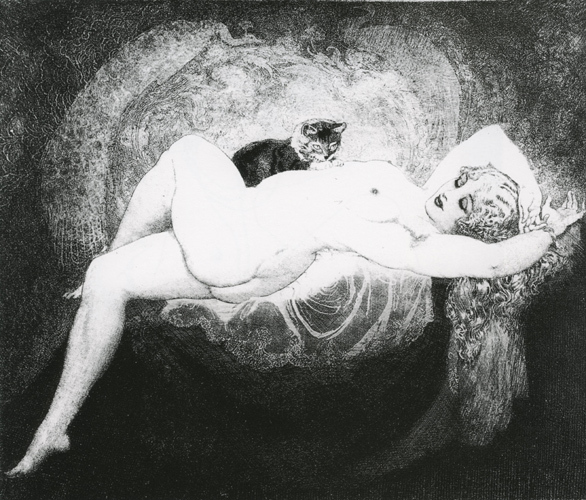 Etching House has over 450 Norman Lindsay images available FOR SALE. 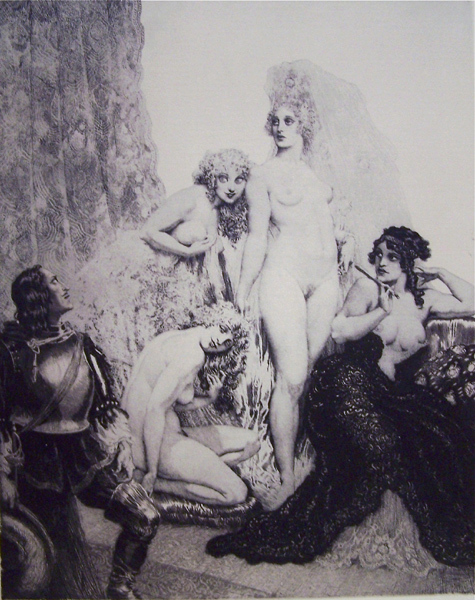 Norman Lindsay Fine Art Etchings, Facsimile, Prints for sale. 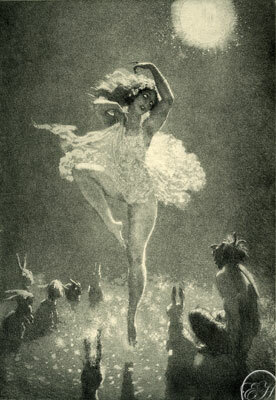 Norman Lindsay Works on Paper, Books, posters, cards for sale. 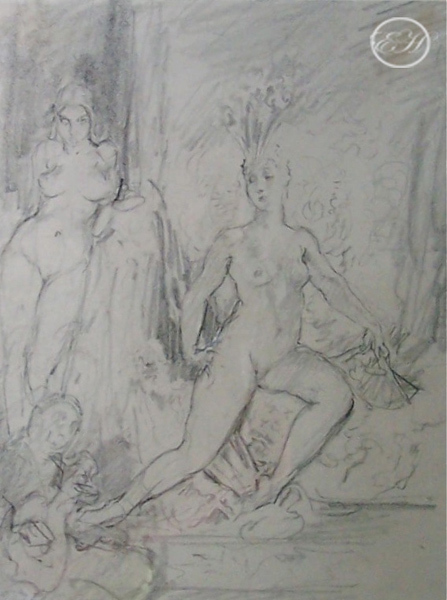 Norman Lindsay Paintings, Pencil drawings and Original fine art for sale. 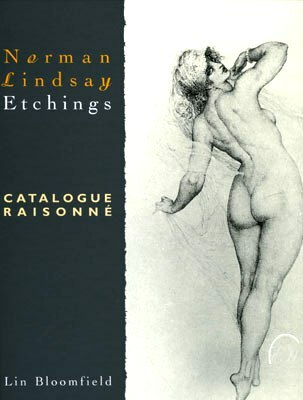 Norman Lindsay Catalogue Raisonne reference book for sale, Oil Paintings Book, Pencil Drawing and water colour books for sale. 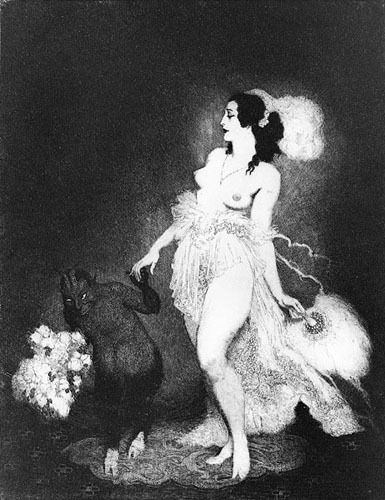 Etching House has found the art of Norman Lindsay’s is so rewarding, enjoyable and yes addictive, how that is meant and best explained this way, pick up a book of Norman Lindsay’s Limited Edition Facsimile Etchings, Oil Paintings or Watercolour Book, sit in a serene place and look with your heart. Afterwards ask your self if you are the same, you will be the only one that will know what you feel. 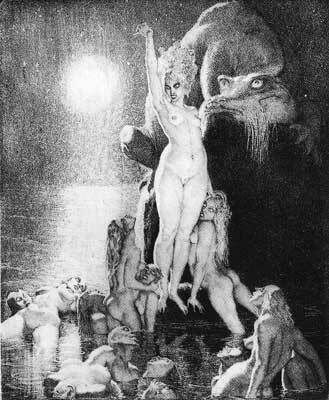 Welcome to the world of Norman Lindsay. 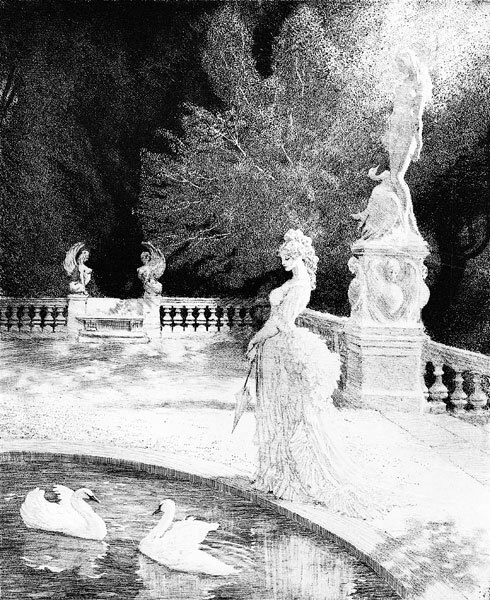 The National Trust collection of Norman Lindsay art works on exhibition is unbelievable, there are Australian Oil Paintings, Water Colours, Etchings, Prints, Sculpture, and Model Ships, and there is a bush garden and empty Pool. We at Etching House visit the gallery and grounds every 6 to 8 weeks while travelling threw, we usually stop for lunch. 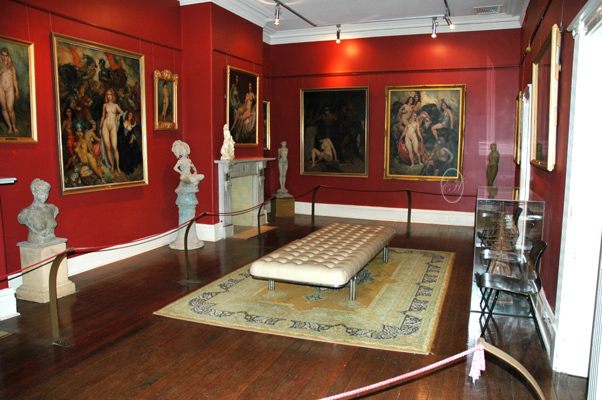 The Norman Lindsay collection is housed in Norman’s magnificent original home on 5 acres of bush land providing a peaceful ambience that can take you back in time. 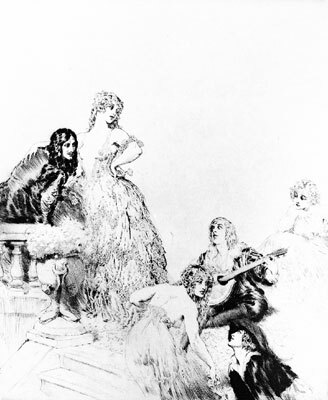 Take a look at some of the pictures on the Etching House web site or in the Etching House Norman Lindsay Artists Archive located on the artist’s page. 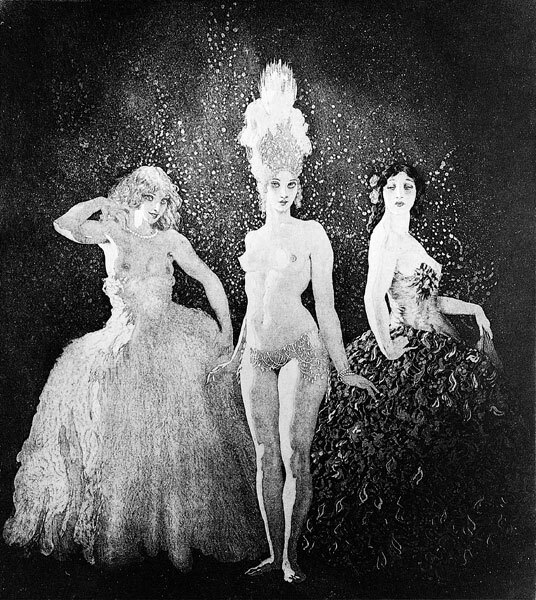 The Norman Lindsay gallery is for all ages and gender, Etching House suggests you see the film Sirens; it is a very well made Australian Film. 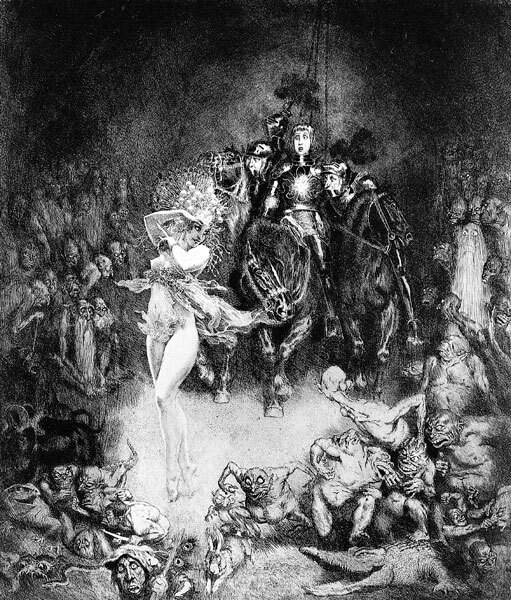 Norman Alfred Williams Lindsay (1879-1969) is arguably one off’s greatest artists. 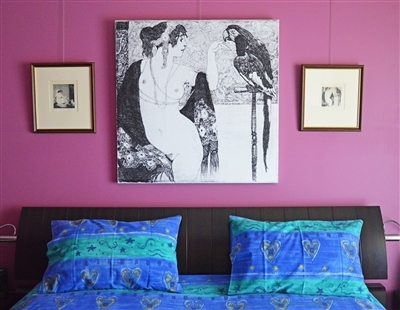 He worked in all media – etching, pencil, charcoal, pen and ink, wash, woodcut, lithograph, watercolour and oil as well as producing many sculptures, both indoor and for the garden. 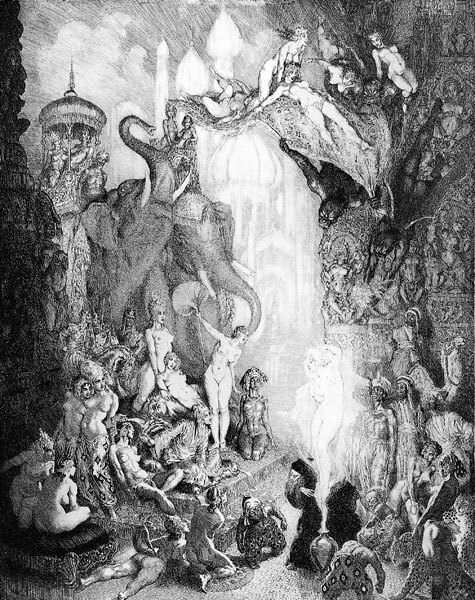 There are more books on Norman Lindsay, about Norman Lindsay or illustrated by Norman Lindsay than any other Australian artist. 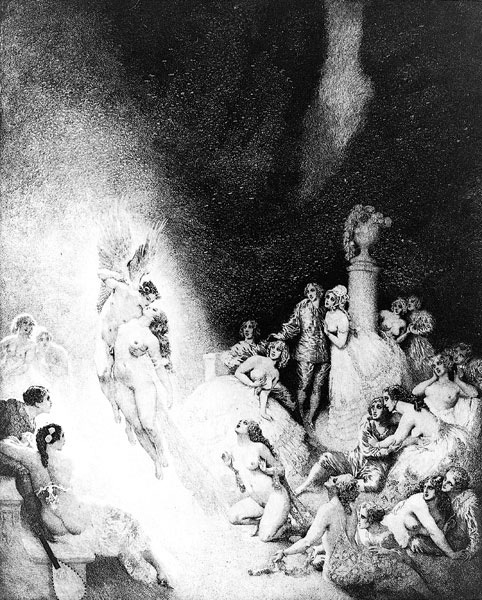 Norman Lindsay is well represented in the National Gallery of as well as every State Gallery plus many regional galleries in. In November 2002 the magnificent oil painting Spring’s Innocence was purchased by the National Gallery of Victoria in Melbourne and is now on public view. 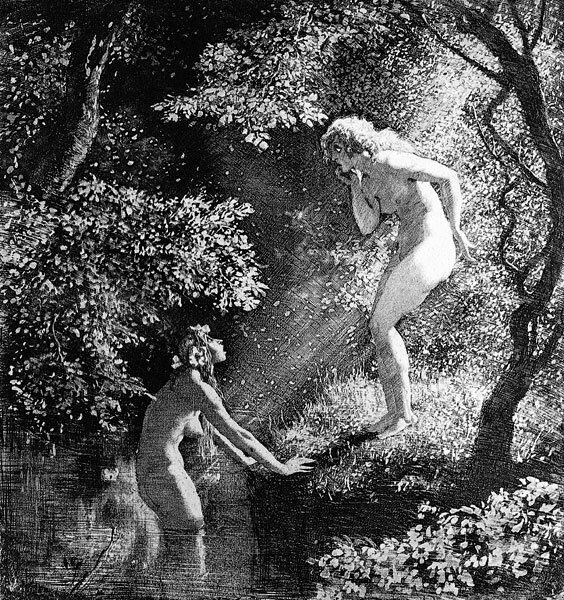 Norman Lindsay is also well represented by visual art, illustrated books or literature in numerous overseas galleries, libraries and public institutions. 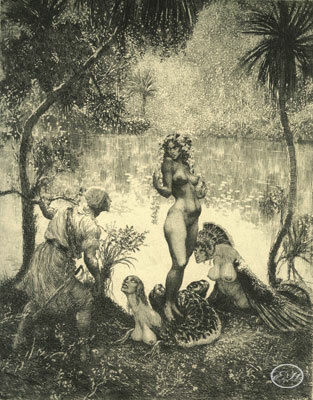 Large collection of Norman Lindsay Etchings and Facsimile etchings at Etching House, Who Follows Unknown seas, Aloha, plus many more. 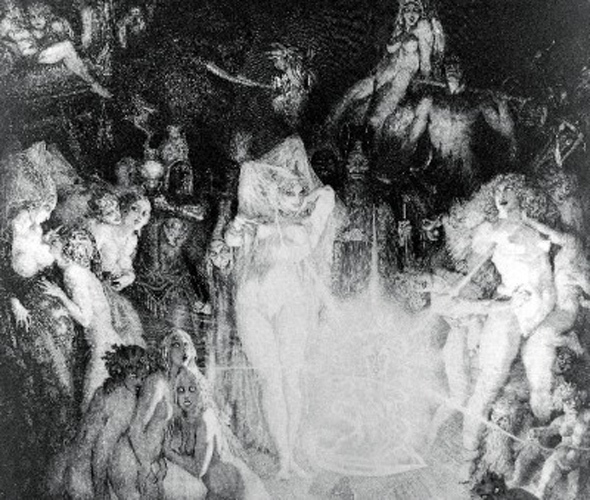 As etching appears to be a lost art today and the public interested in art must have very little knowledge of its technical problems, it may be advisable to explain this as briefly as possible. A highly-polished copper plate is first cleaned with caustic soda and dilute nitric acid. A hand grip is then attached to it, as the plate must not be touched once it is cleaned. It is then held face up over a gas or oil burner till warmed sufficiently to melt the etching ground. The ground is a composition of bitumen, which, through a covering of fine silk, is rubbed over the surface of the copper in a thin coating. A pad, called a dabber, made of white kid padded with cotton wool, is dabbed forcibly over the ground, spreading it thinly and evenly over the surface of the copper. It must be perfectly smooth and even or it is liable to lift from the copper in the acid. The smoke, but not the flame, alone must touch the ground, or it is liable to be burned and so crack off under the acid. The ground is blackened so that the copper line will shine through it when the design is drawn on the copper with a needle point. The preparation of the plate requires considerable experience before it can be done efficiently. The next operation is to transfer the design in outline to the blackened ground. An effective method of achieving this transfer is to blacken a sheet of tissue paper with soft lead pencil to act as a carbon copying paper. This is placed over the plate and the pencil design for the etching pinned over it and traced lightly with the etching needle. The plate is then ready to be needled. There are various methods of needling a plate, too involved to be discussed in a brief note such as this. 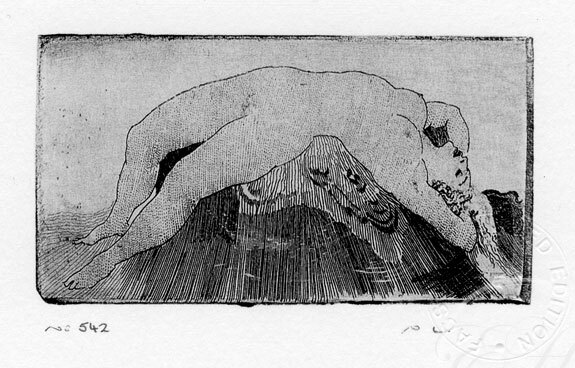 The method employed in the etchings here has been to etch out the fine grey tones first, and by a series of re-etching to add the half-tones and blacks. The etching itself is done by placing the plate in a solution of dilute nitric acid which bites only into the parts of the copper exposed by the needling. While in the acid it is carefully timed by the etcher, and this is the most anxious problem he has to face, for if he miscalculates he may either under-etch or over-etch the passage in the acid, and thereby ruin the result of a week or more of careful work in needling the design. No amount of experience can give him assurance over his timing. He may have got a hard copper which etches slowly or a soft one which etches too quickly. The acid is constantly weakening as it works on the plate, and he must keep adding fresh acid to try and keep it at an even strength. Having no means of testing its strength, he must trust to luck or cunning on equal terms to get the result he wants, and he can only be sure of that by wiping off the ground and taking a proof of the plate. If the result is a failure he has no resource but to discard the plate and start all over again with a fresh one. If the result of the first proofing is satisfactory he re cleans and re grounds the plate and sets about working on the next section to be etched, and so on, proving and re grounding as he goes till the plate is finally completed. If the technique employed is one dealing with delicate tones and elaborate detail he may be a couple of months over one plate; and that he may discard finally if dissatisfied with its lack of the quality he has sought to achieve. It may be said of the etchings that their average is of one accepted to two discarded. 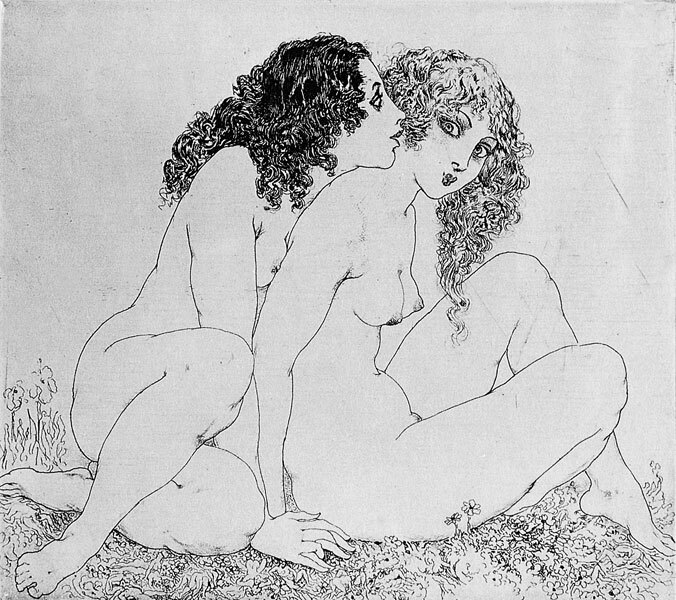 A list of Norman Lindsay Facsimile Etchings released to date March 2008. 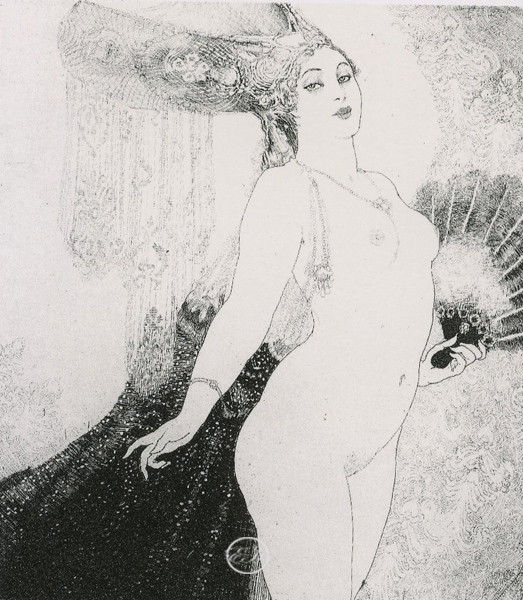 Some key events of Norman Lindsay’s life and activities to give readers a short history of this incredible artist. 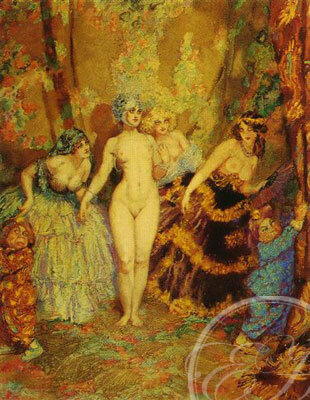 1879 – Norman Lindsay was Born 22 February 1879 at Creswick, Victoria. 1885 – He enrolled at Creswick State School. 1889 – Norman received first fee for a drawing, a prize for Head of a Dog. 1894 – He enrolled at Creswick Grammar School and was editor and chief contributor of the school magazine, the Boomerang. 1895 – Norman left school in December. 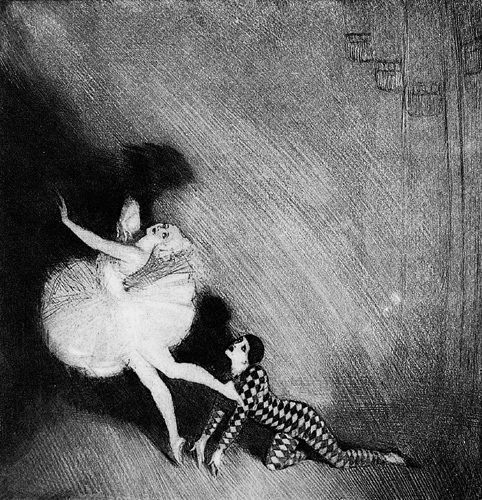 1896 – Norman moved to Melbourne to live with Brother Lionel and worked as Illustrator for the weekly, Hawklet. 1897 – His brothers lived at Charterisville, near Heidelberg. 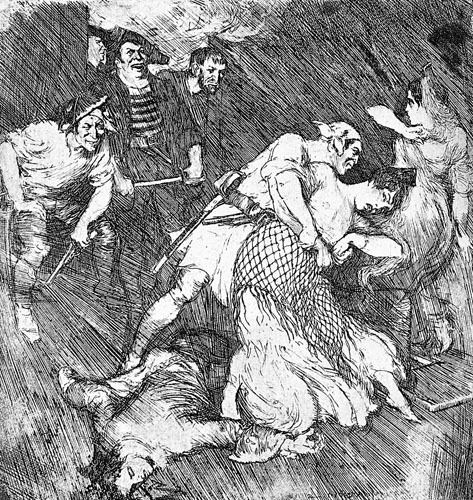 Older brother Lionel Lindsay started to teach Norman to etch, Norman’s first attempt at etching was the etching (Pirates’ Captives). 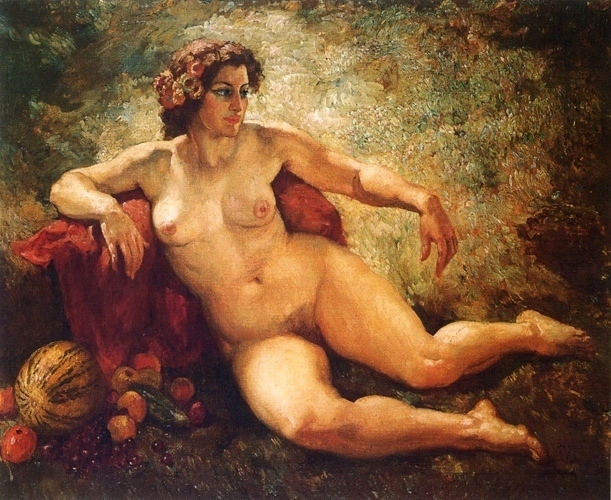 C1898 – He attended life drawing classes in Melbourne organised by George Coates. Read Nietzsche’s Anti-Christ and Zarathustra. 1900 – Norman married Catherine (Katie) Parkinson on 23rd of May and Began a series of pen drawings to illustrate the Decameron, Norman’s Son Jack was born on 28th of December. 1901 – Norman collaborated with John Longstaff on the invitation and program for the opening of first Federal Parliament. Norman moved to Sydney to work for the Bulletin, he rented a house at Lavender Bay, it was the first of several rented houses in the suburbs, and Norman also rented the studio in Rowe Street where he was joined by Katie and Jack. 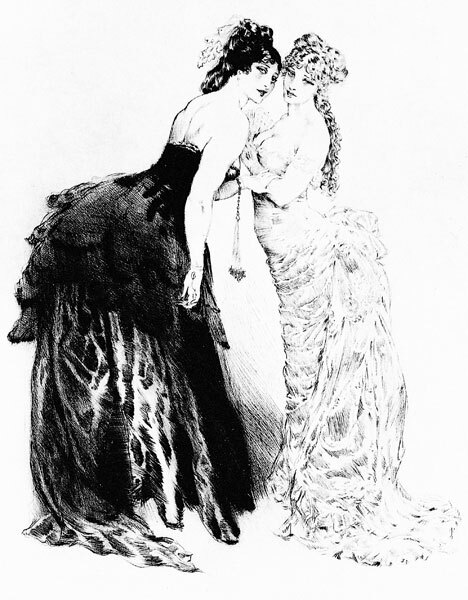 1902 – Norman met Rose Soady who began as his model. 1903 – Katie went to Melbourne for the birth of son Raymond; Norman then moved his studio to Bond Street. 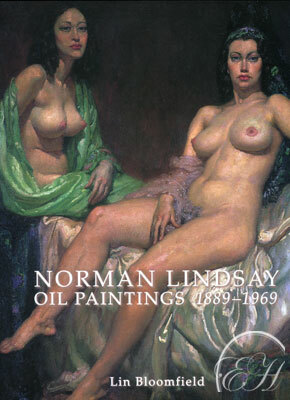 That year Norman joined the Royal Art Society of New South Wales. 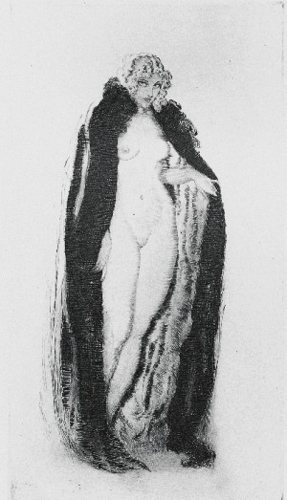 1904 – He exhibited the pen and ink drawing Police Verso at the Royal Art Society provoking first controversy over his work. 1906 Living at Lavender Bay Normans Son Philip was born. 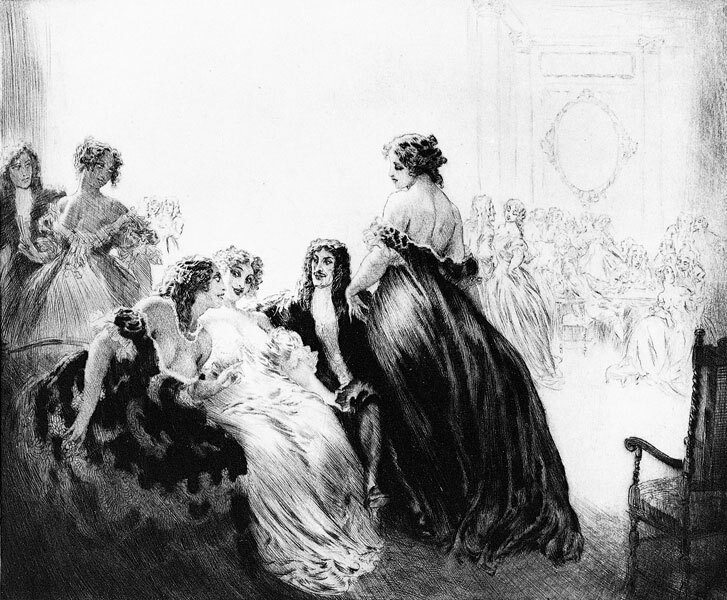 He began a series of 100 illustrations for Memoirs of Casanova. 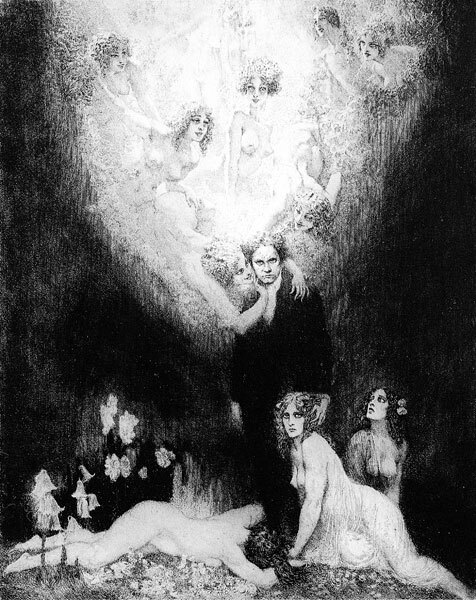 1907 – Norman joined the Society of Artists. 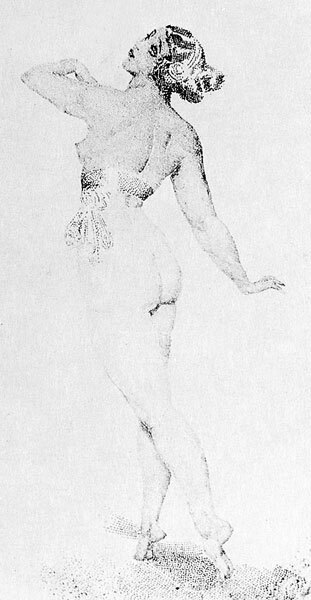 Police Verso was purchased by the National Gallery of Victoria for 150 guineas; this was at the time the highest price paid for an Australian pen drawing. This year the first issue of the Lone Hand was published 1st of May. 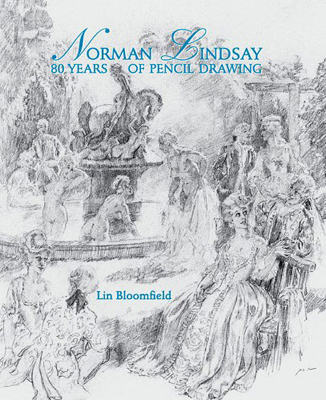 1909 – While Norman was living at Willoughby with Rose he held successful exhibitions in Sydney and Melbourne. During that year Norman sailed for Europe on the 4th of October taking crated Casanova drawings. 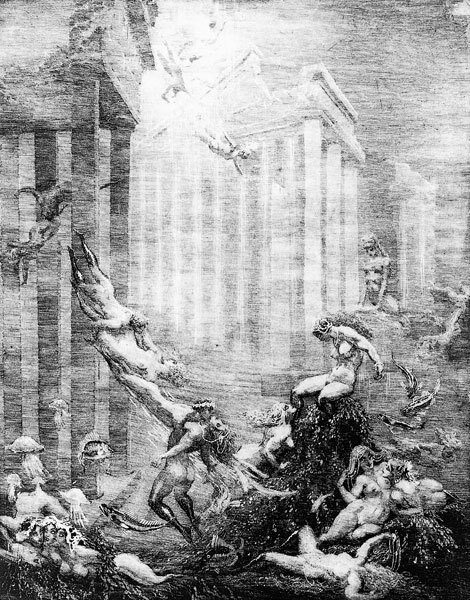 He visited Pompeii where he began sketches for the Satyricon. Norman arrived in London in November and took a studio at Hampstead. Katie and the children moved to Brisbane. 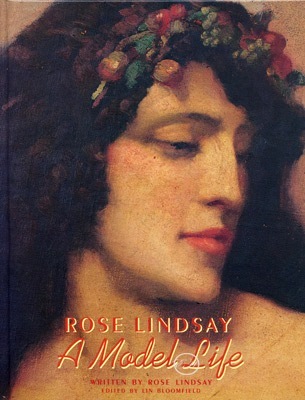 1910 – Rose arrived in London in March. 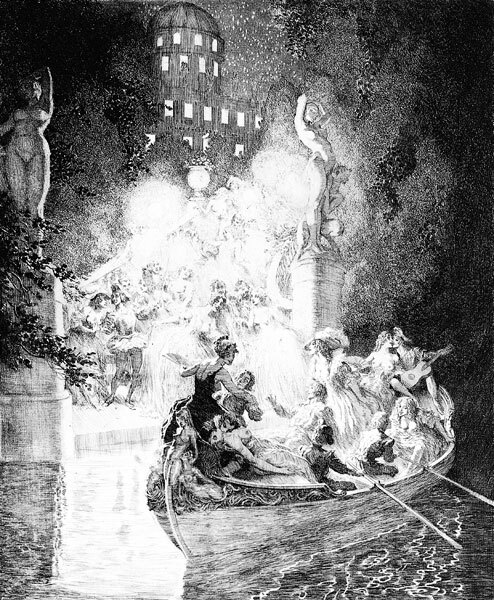 Norman visited Paris and failed to find a publisher for the Memoirs but Ralph Straus published the Satyricon of Petronius with 100 illustrations. He spent weeks sketching ship models at South Kensington Science Museum. 1911 – Norman arrived in Melbourne 2nd of January 1911 with Rose. He returned to Sydney and resumed work for the Bulletin and Lone Hand. Norman was hospitalised for three months with pleurisy, he convalesced for six months with Rose in rented houses at Leura and Faulconbridge in the Blue Mountains. Norman had completed the ship model of Cook’s Endeavour which was purchased by the National Gallery of Victoria. 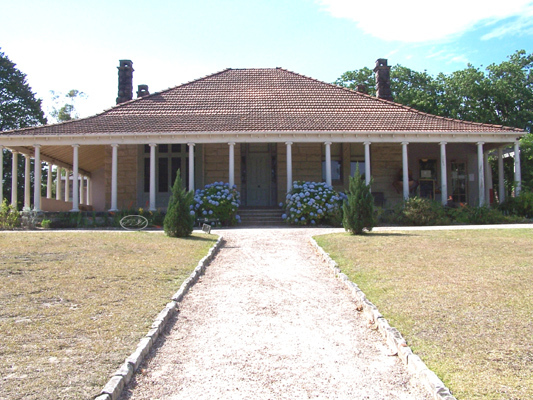 1912 – Rose purchased a house in Faulconbridge from Francis Foy which became the family home (known as Springwood). 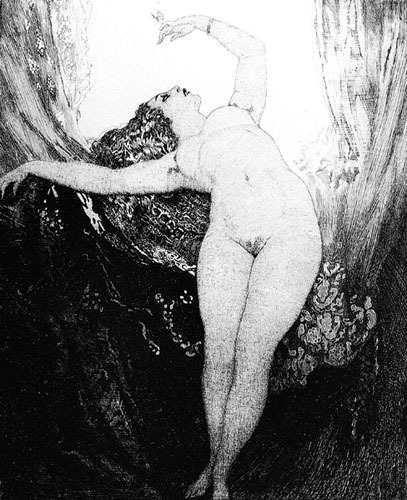 Norman exhibited the pen and ink drawing The Crucified Venus causing some controversy; he later built the lower studio by cutting stone from rock face. 1913 – Norman began outdoor sculpture. At this time his Father, Dr Lindsay was staying with Norman at Springwood. 1914 – Norman’s brother Daryl Lindsay was also staying at springwood. 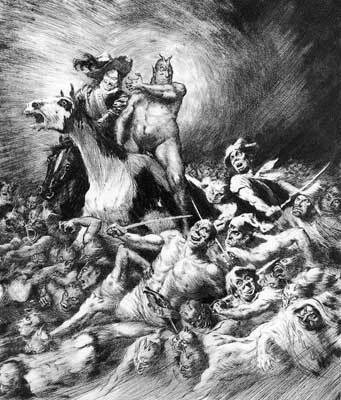 Norman did his First war cartoon, The War God of Europe, it was published in the Bulletin 13th of August. Norman in 1914 built a huge out door swimming pool at Springwood. 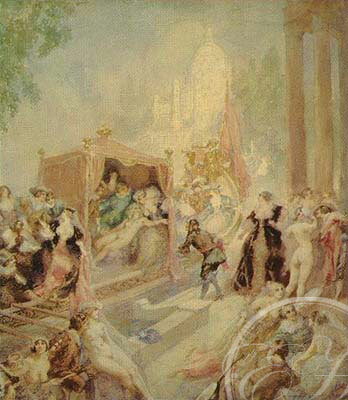 1915 – He built a model of medieval Paris as background for series illustrations to the poems of Villon. 1917 – This year Brother Reg was killed on the Somme. It was the year of the First rift with Lionel occurred. 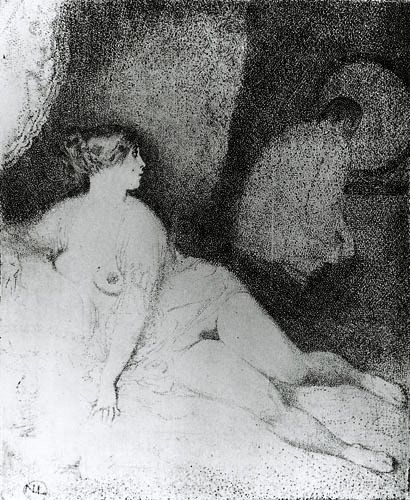 Norman also published his first etching, The Fan. 1918 – Norman divorced by Katie in 1918. 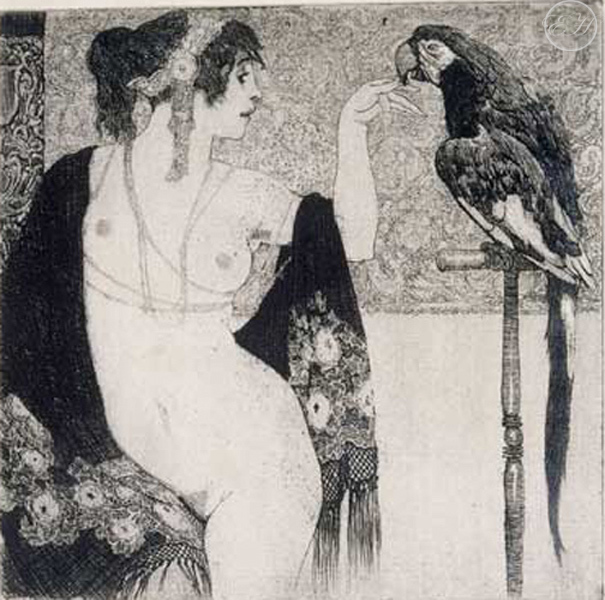 1919 – This was Norman’s first one-man show of etchings in Sydney and Melbourne. He built a second studio at Springwood, converting it for etchings. 1920 – He married Rose and Daughter Jane was born that year. 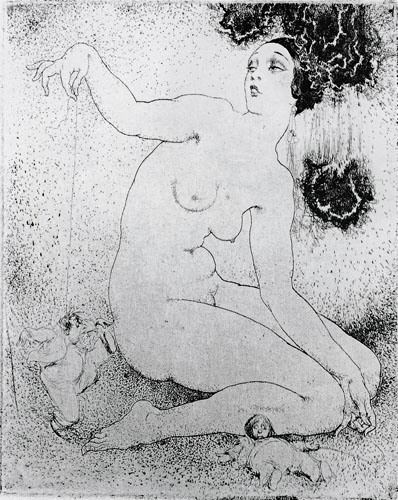 1921 – Norman joined the Painter-Etchers Society. 1922 – Helen (Honey) Norman’s daughter was born this year. The rift with Norman and older brother Lionel Lindsay sadly became permanent. 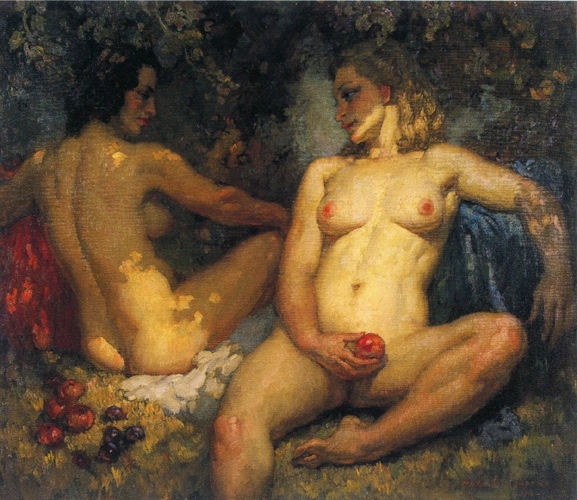 1923 – Norman was represented at the Society of Artists Exhibition in London where the subject matter of his works aroused controversy. 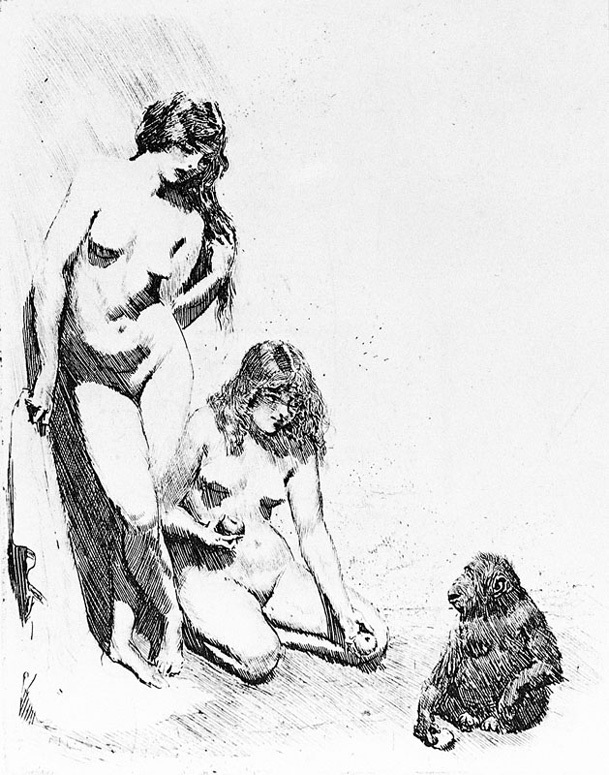 Critic Sir William Orpen derided Norman’s works. Norman ceased working for the Bulletin this year. 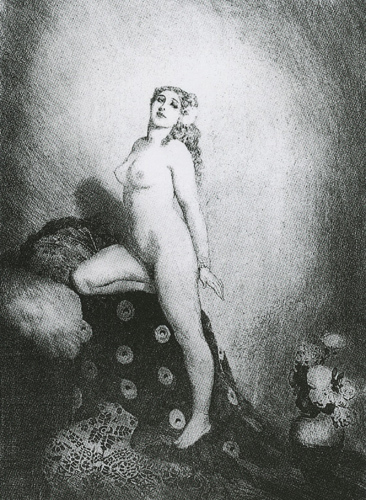 1924 – Norman had eleven works exhibited during Artists Week in Adelaide witch provoked a furore. Also this year Nellie Melba visited Springwood. 1925 – Sons Jack, Ray and Phil now where living in Sydney and visited Norman frequently. It was also the year Fanfrolico Press was launched with Jack and John Kirtley. Will Dyson was at that time staying with Norman in Springwood. 1926 – Jack Kirtley moved to London at this time. Norman built a courtyard at back of house at Springwood. 1927 – He designed the famous sphinx radiator cap in collaboration with sculptor Raynor Hoff which became a Springwood logo. Norman at this time also built the wisteria walk along the side of the house, still there today. 1928 – Phil had moved to London. Brian Penton was staying with Norman. 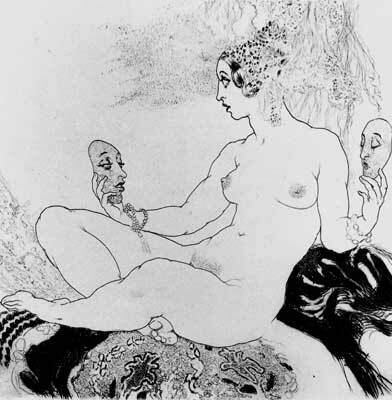 1930 – Etching Self-Portrait caused police to raid on the publishing house, volumes where confiscated. The publicity caused a public Furore. 1931 – Norman visited with Rose, leaving 23rd July. He wrote illustrated articles for American publications. 1932 – Norman sailed for in January with Rose. With Brian Penton and P.R. (‘Inky’) Stephenson he worked to establish a publishing company for Australian books. Norman then returned to with Rose in April and resumed work for the Bulletin. Inky Stephenson arrived in September to collaborate in launching Endeavour Press for which Norman designed a ship symbol. 1933 – The marriage to Rose was foundering due to the divided time between Springwood and Sydney where he stayed at the Hotel Wentworth. 1934 – Norman left Springwood and moved into a studio at 12 Bridge Street, Sydney where he began seriously painting in oils. 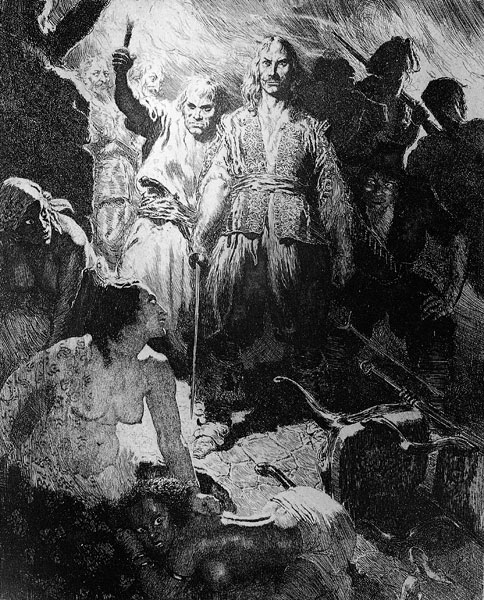 1938 – Norman published his last etching, Visitors to Hell. 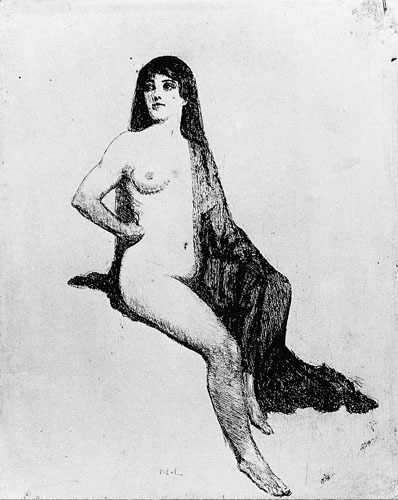 1940 – Rose sailed for with honey and her husband Bruce Glad taking sixteen crates of Norman’s drawings, etchings and paintings. 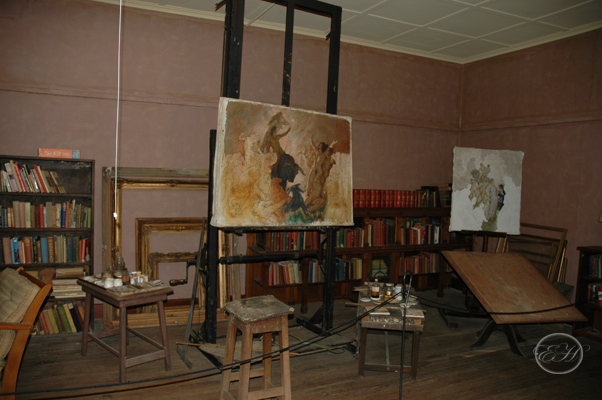 Norman retained the Bridge Street studio to paint from the model but later returned to live at Springwood with daughter Jane. 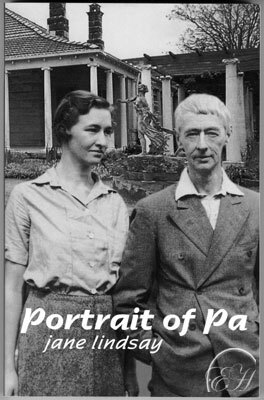 1941 – Almost all of Norman’s works that where taken to where destroyed by a fire on a train in Pennsylvania. 1947 – Honey went to live in December. 1949 – Jane acquired the etching studio at Springwood and built a house around it. 1956 – Norman gave up the lease on the Bridge Street studio. 1960 – Son Raymond Lindsay died in 1960. 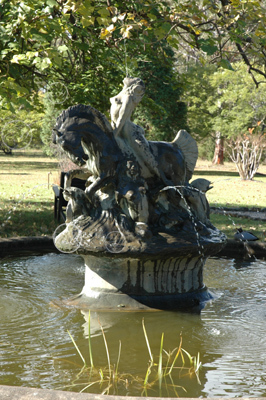 1968 – Norman built the last fountain; it was his only work in cast cement. 1969 – Norman donated a collection of work to the University Of Melbourne School Of Architecture in January. 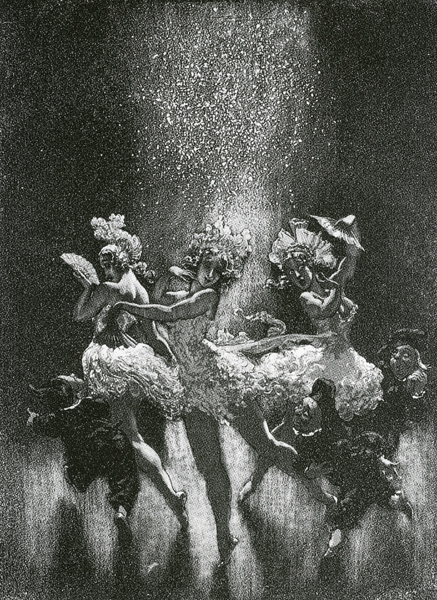 Norman Lindsay died in hospital on 21st of November 1969. 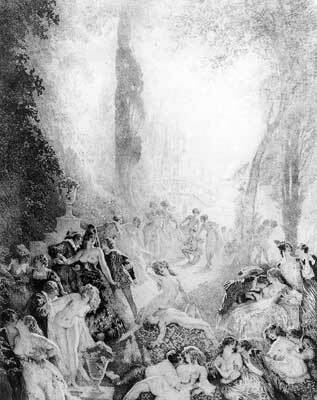 1973 – On the 25th February 1973 the National Trust opened to the public the “Norman Lindsay Gallery and Museum” at Faulconbridge. 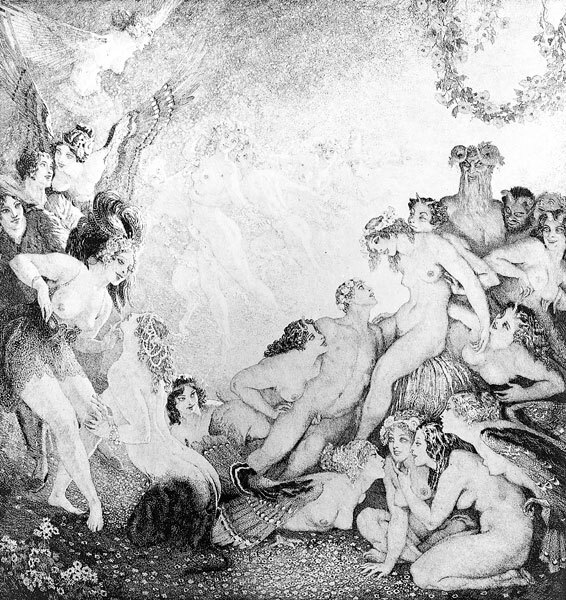 Etching House is proud to support and be involved with the National Trust –www.nsw.nationaltrust.org.au and the Norman Lindsay Gallery. During the 1930’s and 1940’s Lindsay decided he needed a ‘a fresh approach to art’ and began to focus on a series of large ‘gallery’ Oil paintings. He had dabbled with oils as early as the start of the 1900’s, His oil paintings included the large works based on history, mythology and literature, portraits and the smaller works where he focused on rich and contrasting colours. One Inch per 8 hours of painting was Normans average pace and he loved the southern light for contrast and accurate light. Lindsay kept a book full of the names and contact details for models and kept most of them busy. But it was Rose in her early days and Rita later in his career that he considered his two most beautiful models. 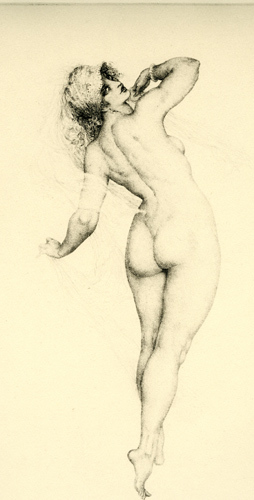 When he was unable to use live models he would refer to the pencil studies he had amassed over many years for the correct proportion and muscular definition. He was able to achieve more accurate skin tones with oils discovered it to be a medium in which his love of theatre and costume could be better expressed. It is believed Lindsay made a total of fourteen model ships of witch there are several on display at his home. He claimed his interest in ships dated back to his early years when his family’s maid gave him a fully rigged model ship. Lindsay saw his Model ships have a way to relax and enjoy time away from his studios. 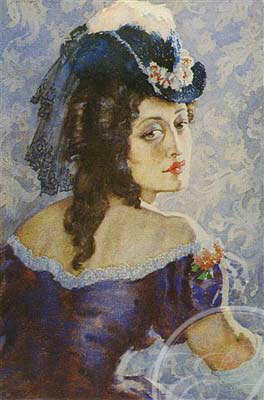 After the First World War Lindsay began to experiment and develop his skills as a watercolourist. His association with artist Balmier Young provided him with a foundation from which to expand his skill, building up on the initial washes to become quite dramatic and detailed. His watercolours are often emotional and always captivating with the viewer’s eye drawn to all parts of the paper which has been carefully constructed. Each of Lindsay’s works inevitably tell the story of each of the many characters which are depicted. 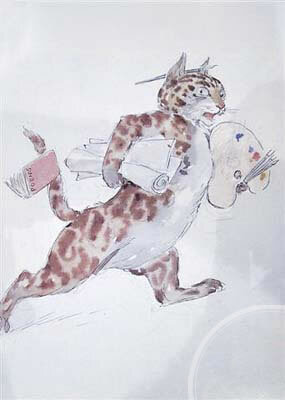 It is unknown exactly how many watercolours Lindsay produced, rather it is said he was ‘prolific’. 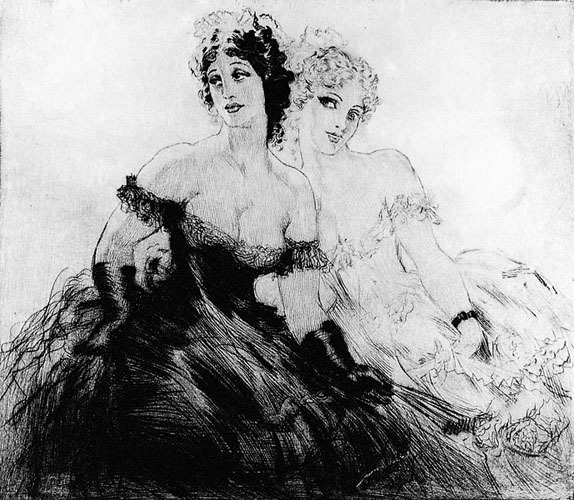 Lindsay had experimented with etchings as early as 1997, but it wasn’t until 1919 that he discovered the medium in earnest. 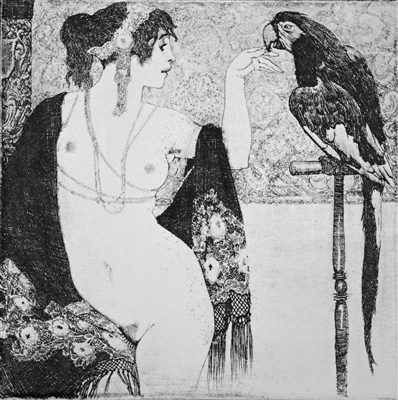 The success of Lindsay’s etchings where due to both Norman and Rose combined skills, Rose was also widely recognised as a master printmaker. 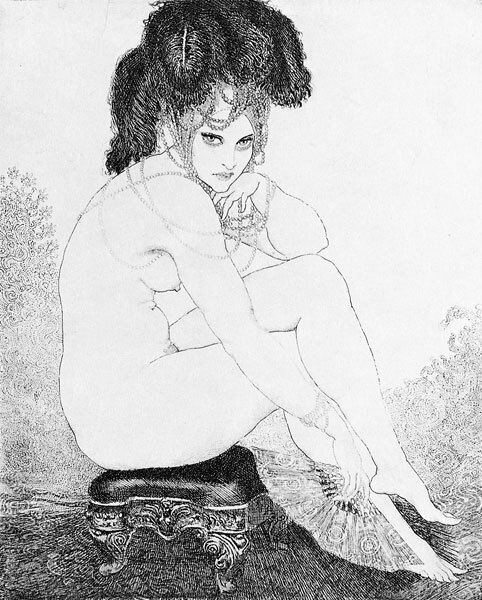 Together they published 200 etchings and at least 175 which were unpublished. 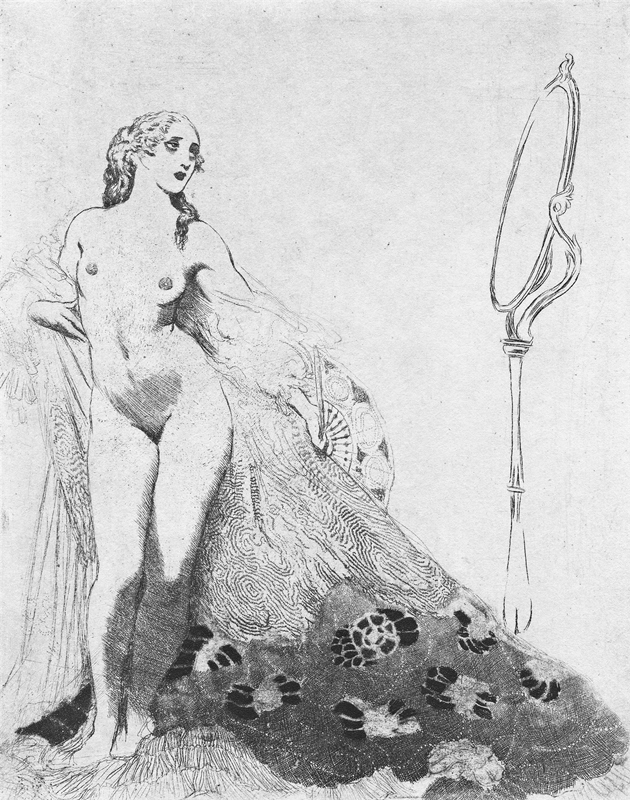 The original etching editions had a maximum of 55 copies but a large number the plates failed before and the number produced was significantly less, this is due to the material used in those days where often genuine soft copper, to day you use a hardened material..
On 30 November 1974 Lin Bloomfield; founder of Bloomfield Galleries, in response to Lindsay’s original etchings becoming increasing unattainable, and after consultation with Jane Lindsay, released the first three folios of the facsimile etchings. 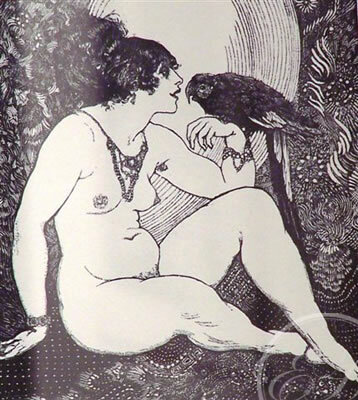 Lin Bloomfield retains the copyright on all of Norman Lindsay’s etchings and facsimile etchings. Editions are restricted to 550 and each is individually numbered. Authenticity is guaranteed by an embossed seal (see below) with a dot in the 6:00 o’clock position. All works have a Certificate of Authenticity and once an edition has sold out, the image is never again released. All original plates used for the facsimile etchings are used in the printing process are cancelled, any other material is destroyed. 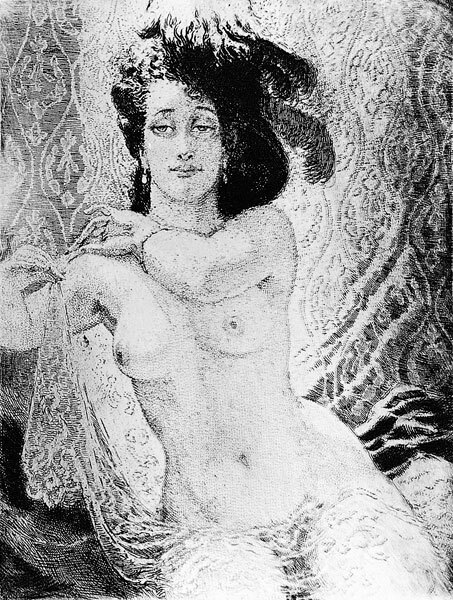 The facsimile etchings have retained and increased in both their popularity and value with many now in some cases commanding several thousand Australian Dollars. 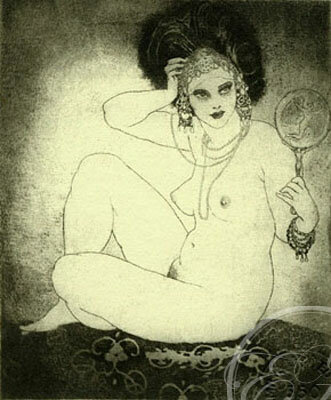 Etching House specialise in Norman Lindsay fine art, etchings and prints. 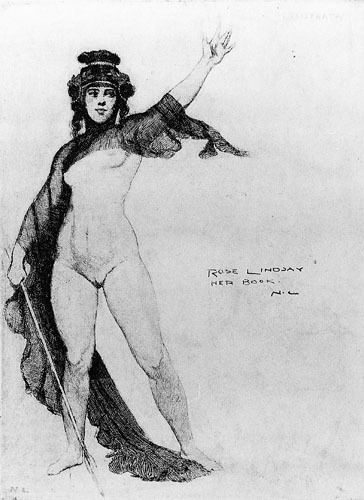 In 1895, Lindsay moved to Melbourne to work on a local magazine with his older brother Lionel. In 1901, he and Lionel joined the staff of the Sydney Bulletin, a weekly newspaper, magazine and review. There they drew caricatures, cartoons and illustrations on demand – often in a style nearly indistinguishable from each other. Lionel on the right, and Norman is on our home page. Norman’s association with and contributions to the magazine would last over fifty years. 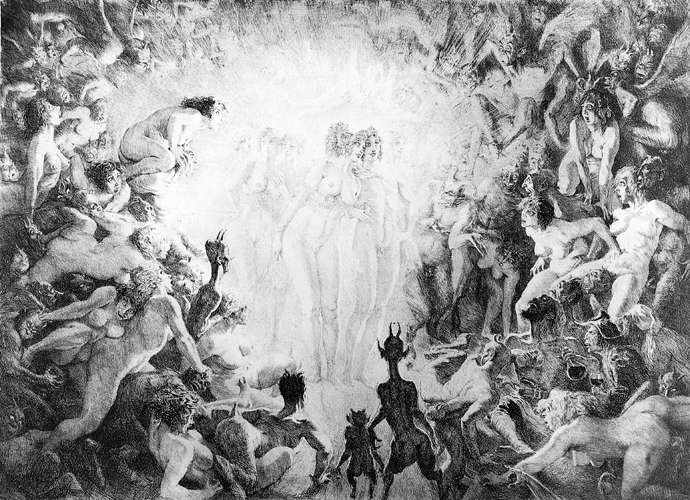 Norman Lindsay’s love of art began with pencil drawings. In his youth the scarcity of paper would see he and his brothers would search their home town for anything to draw on. 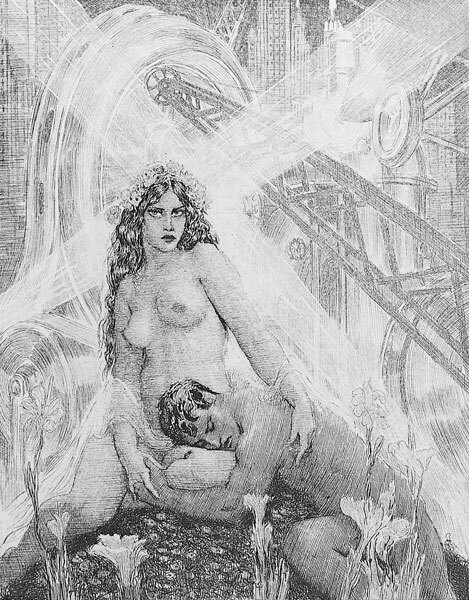 He grew up keening studying the works of other artists, and was inspired by the works of Albrecht Durer and Urs Graf. 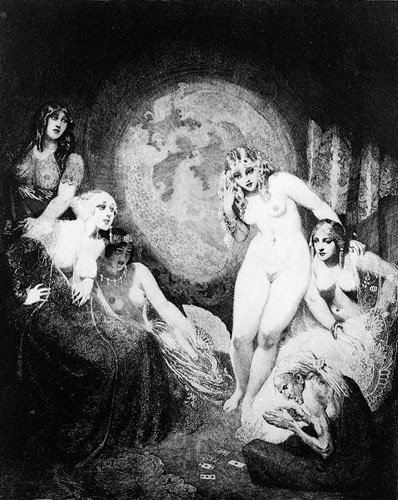 Etching House and other skilled Norman Lindsay specialists are often asked to validate the original pencil drawings as well as many other works made by Norman.Norman Lindsay at Etching House Sydney affordable art show 2010.Norman Lindsay at Etching House Melbourne affordable art show 2011.Norman Lindsay Facsimile Etchings and Prints framed in rag paper with pigment ink available at Etching House, lay buy welcome.Norman Lindsay books Posters prints cards at Etching House Affordable Art Show Sydney and Melbourne. 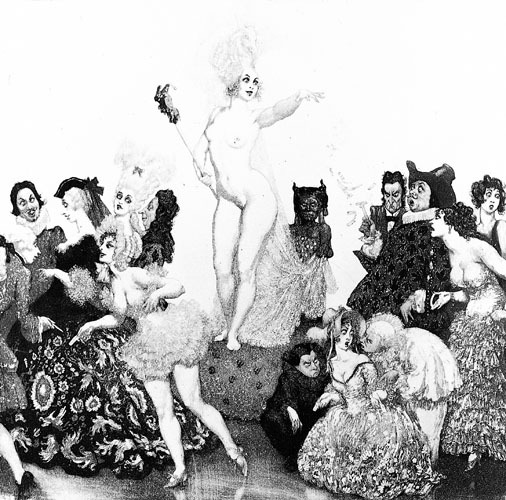 Norman Lindsay Australian Art at Etching House. 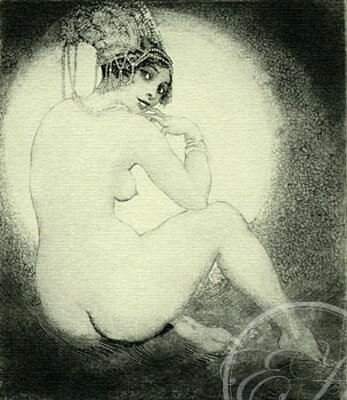 Norman Lindsay Australian fine art etchings, prints and ceramics at Etching House. 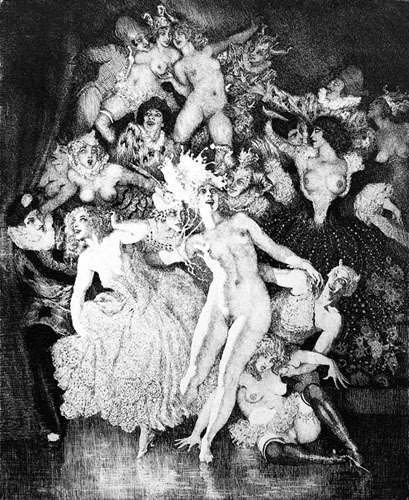 Norman Lindsay large range of etchings prints and some ceramic works all at the Etching House Melbourne Art Fair May 2011. 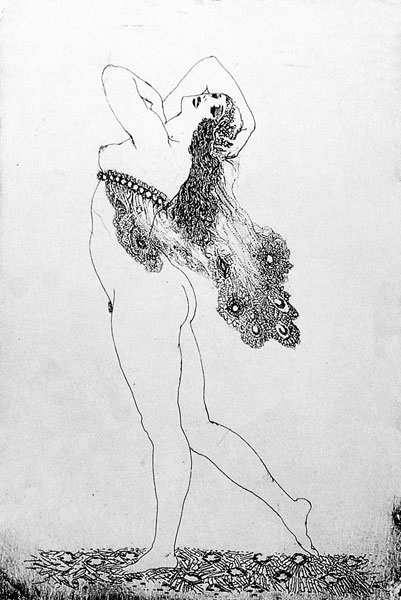 Many of Lindsay’s drawings were completed during his employment with The Bulletin. While it provided him with an income his creativity was stifled by the strict editorial guidelines of the publication. Regardless of the fact that these works were cartoons his attention to the message and tonal detail was painstaking. He would complete his cartoons at his home in Springwood from editorial instructions. In his early years he corresponded with the newspaper by post and later by telephone. As the Bulletin began to fail on the back of it’s historically strong and unpopular political views Lindsay’s association was terminated by the then editor in 1958. 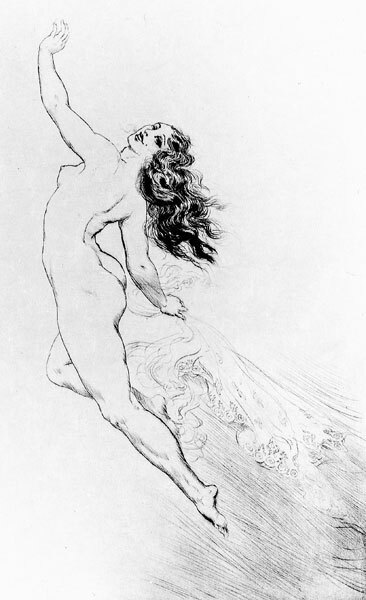 In addition to his many works of art, Norman Lindsay was the author of eleven novels. These novels were, “Curate in Bohemia” 1913, “Red heap” 1930, ” Miracles by Arrangement” 1932, ” Satur Dee” 1932, “Pan in the Parlour” 1933, “The Cautious Amorist” 1934, ” Age of Consent” 1935, “Cousin from Fiji” 1945, “Halfway to Anywhere” 1947, “Dust or Polish” 1950, and “Rooms and Houses”. There were also two children’s books, the most famous being “The Magic Pudding” 1918, and the second “The Flyaway Highway” 1936. Other books included an autobiography: My Mask 1970, and “Reminiscences: Bohemians of the Bulletin”.